The capsid bug on 27th July has been identified as Calocoris stysi. Thanks to Stevie and/or Stephen (not quite sure if you're the same persons). Cloud, showers and some sun. 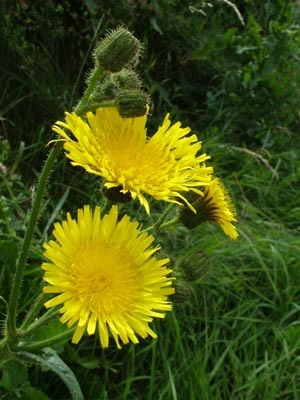 Another plant I look forward to seeing: Perennial Sow-Thistle - Sonchus arvensis. This is by far our largest local yellow Daisy, often more than 1m. tall, with flower-heads up to 8 cm across. There is a patch of these at sea-level where the individual specimens approach 2m tall. Here's a bit of fun. Two of these images are of the Honey Bee. The other two are of Eristalis pertinax - one of the Drone Flies, so-called because they strongly resemble honey bees. Your job is to sort the images into pairs and identify them. The clues are all there. Answers tomorrow, and no, the file names won't help you.